With the end of August coming up and a hint of autumn in the air, it feels that the summer is almost over. Except it's not, just yet. The days are still hot and I'm still consuming quite a lot of cold drinks, mostly tea and water, but occasionally something a little more sweet and fruity. In addition to super-light flavored waters like the ones I shared in my last post, I've been having fruit-based drinks that are slightly (or a lot) more substantial, but just as refreshing and delicious, packed with season's fruits. Here are some of them. The first one is made with gooseberries, which appeared in the beginning of July around here. I don't expect them to be around now, but if you happen to have a bag of gooseberries in the freezer that you saved during their short appearances as I did, you're in luck. 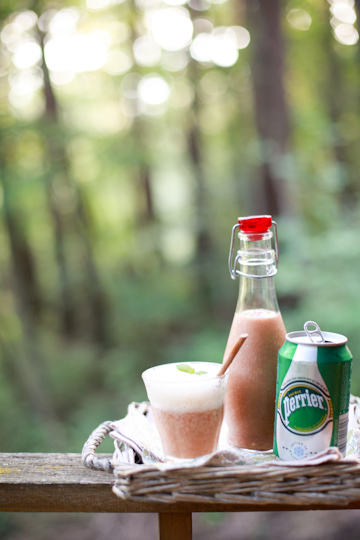 Because this gooseberry ginger ale is really nice and makes a perfect thirst quencher on a hot afternoon. While I love my honeyed ginger ale I wrote about last time, this is a bit different, but just as spicy, and refreshingly tart, thanks to the little berries, which have been baked in the oven first, before being blended with other ingredients to make a ginger ale 'base'. What's more interesting though is the use of sultanas, which seems to add a depth of earthy flavor and warm sweetness without making the whole thing heavy. I first tried this recipe a few summers ago, looking for interesting ways to use up our gooseberries from the local green market. It was certainly interesting, and in a good way; we all enjoyed it and I'm happy to have made it again this summer. I used honey as the sweetener instead of sugar (used in about 2/3 by weight), and it turned out perfectly fine. To tell you the truth though, the berries I used this time were on the side of being overripe and thus not as tart as the young green ones, and I was worried if that might affect the taste of the finished ginger ale. To my relief, it didn't - not in a major way. The color was redder than it should be, but tastewise, it was just as tart as I'd remembered it would be. The picture above is a one that I took last time I made it, and you can see the difference in the color. Either way, it's a true refresher. 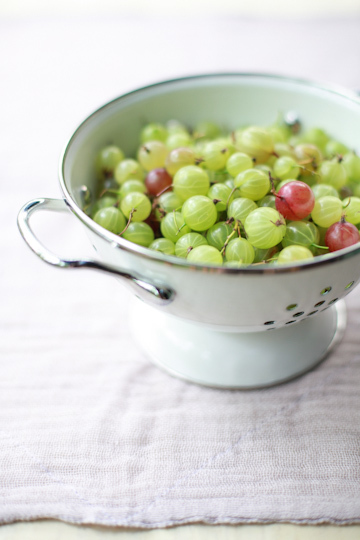 Now gooseberries may be over, other summer fruits are still going strong. Such as peaches and nectarines, both of which I seem to have been binging on the whole summer. While I like to eat peaches and nectarines (white ones, that is) fresh, when I have a huge supply, I don't mind turning some of them into some desserts. 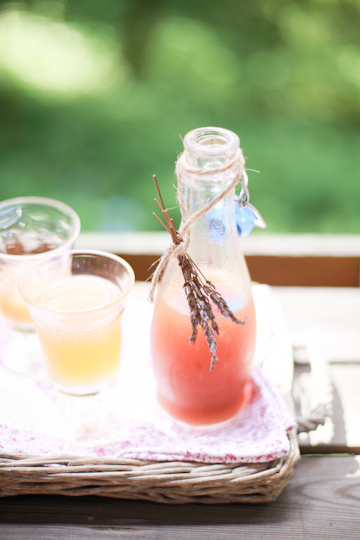 Or drinks, like this white peach-lavender soda. 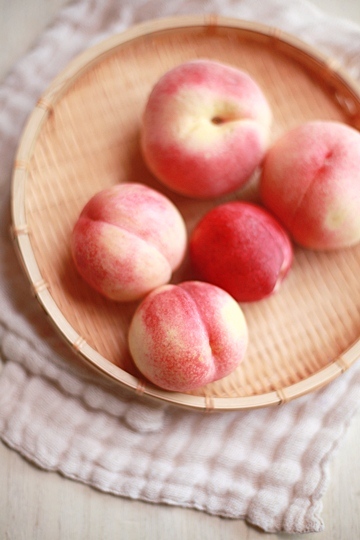 Chunks of ripe peaches would take a quick bath of lavender-infused, lightly-sweetened hot water before being pureed into a smooth, pinky-brown mixture which would then be topped with sparkling water. I found the recipe while I was searching for flavored water ideas, and although this wasn't what I was after at the time (I was looking for very lightly flavored, just-infuse-it water ideas) I still bookmarked it so I could try it later. And I did, to make a bottle of a peachy sweet syrup with just the right amount of lavender flavor (which is just a whiff of it). I wish it had had a delicate shade of salmon pink like the one you see with the original recipe, but it was okay. 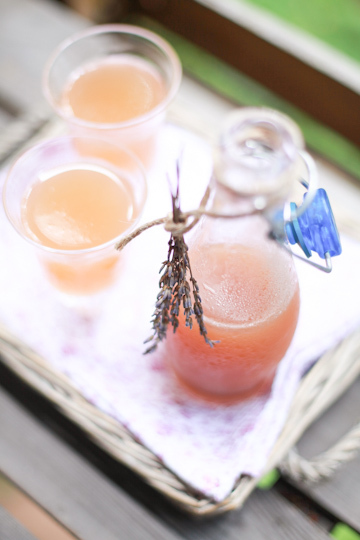 Like the lavender honey lemonade I made last summer, this one transports you right to summer in Provence, even when you are on the other side of the planet. And like the lemonade, my choice of sweetener here was honey, which added a gentle note to the drink. After Provence, next stop: Latin America...? Well, not exactly perhaps, but this was nevertheless pretty darn fine thing to drink, to cool down on a balmy afternoon in Japan. 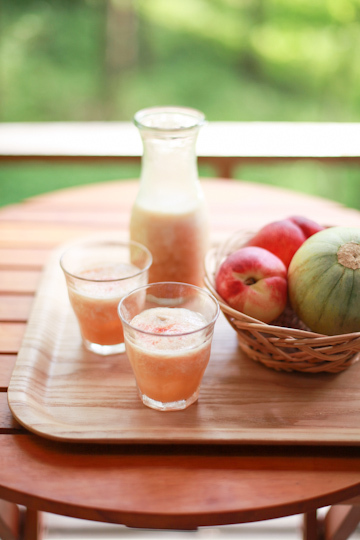 This is melon nectarine agua fresca, whose recipe I was chuffed to find here and tried on the following day or so. 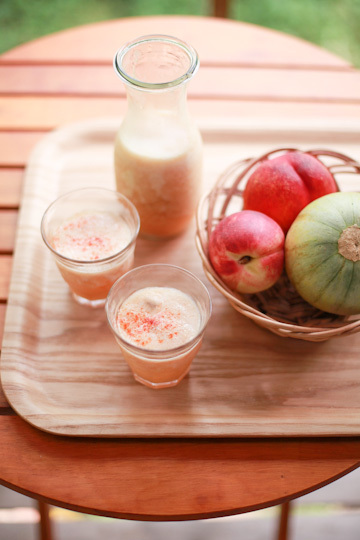 I started by scooping the flesh of a small melon from a family friend's squash patch into the blender, and a really ripe white nectarine along with it. I had to swap lemon for lime (no lime to be seen here in the deep countryside of Japan...), and while lemon just isn't the same as lime, it nevertheless gave the drink a pleasantly sharp note. My folks enjoyed this frothy drink straight from the blender (with ice), but I was curious to try a dash of red pepper powder to top it off, as David suggested in the recipe. The effect was instant and brightening; the icy and sweet drink was lovely as is, but I loved how the little heat spiced things up to such a great effect. The only thing I wished (other than to use lime instead of lemon) was that I could have used a bit sweeter melon; it was fine to snack on, but made the drink a little too watery. Next time I might use a little less water. Or use a sweeter melon in the first place. Blueberries! I've been buying quite a few punnets at the green market, and picking even more at the PYO farms. They are great to snack on, lovely in desserts both fresh and cooked, and happen to make an exceptionally good smoothie, too. 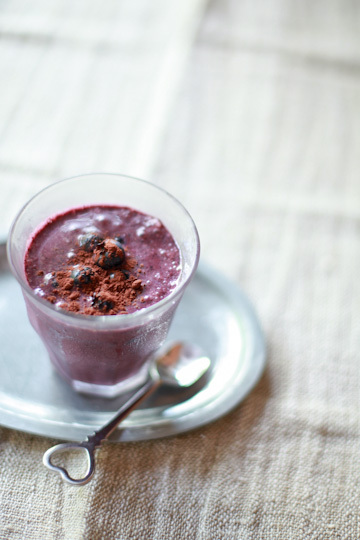 Well, a blueberry smoothie may not be such a special thing, but this blueberry chocolate smoothie is a stunner. I first tried it a few summers ago, and it immediately became our summertime favorite, and I've since been whipping it up numerous times in the hot months. The recipe is from Lucid Food, a beautifully-photographed, inspiring and enlightening cookbook written by a New York City-based natural food recipe developer, cooking instructor and cookbook author Louisa Shafia. The book is full of approachable and exciting recipes, but this one must be one of the simplest to make, as all you need is to throw everything into a blender and whizz it up. But that's the beauty of it; so simple, so good. 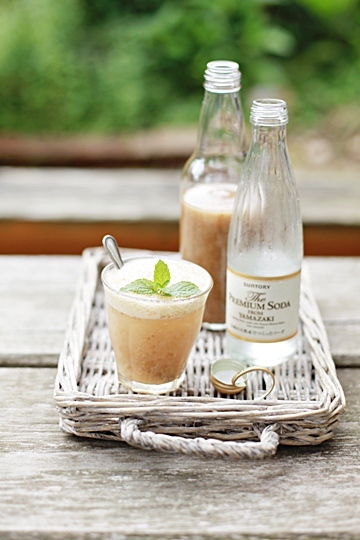 Rich without being heavy or cloying, it's like a liquid dessert - a very healthy one, for sure. I really wanted to share the recipe with you all, and was thrilled when Louisa very kindly gave me a permission to run it here. So get your blender out and be ready..
Place all of the ingredients in a blender and blend until smooth. Serve immediately. Garnish with extra blueberries, if desired. Reprinted with permission from Lucid Food: Cooking for an Eco-Conscious Life by Louisa Shafia. Ten Speed Press, 2009. It's a great recipe to make when fresh blueberries are in season and abundant, but I've made it with frozen berries, too, which works just as good. 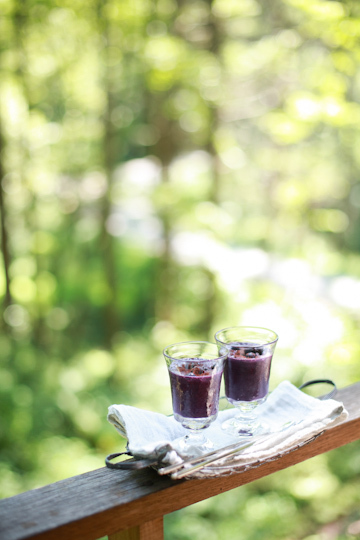 When I use frozen blueberries, I use them unthawed, and sometimes replace some of the ice (about 1/4 to 1/3) by water, just to help the mixture blend smoother. 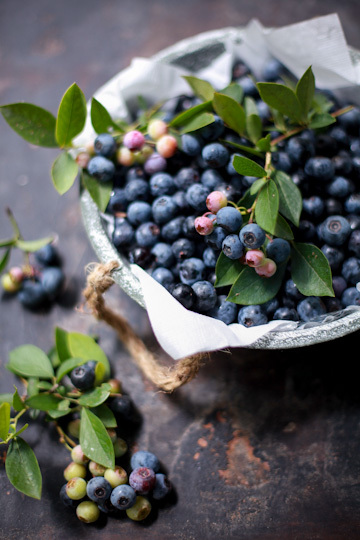 1 cup of blueberries are about 130-140 grams. Depending on the sweetness of my berries, I sometimes like to use a little more maple syrup than the recipe says, but not much. As for the milk, Louisa invites you to use any kind of milk, and I've tried regular (whole) milk, low-fat, a mixture of milk and yogurt, etc., but our favorite is soy milk - plain, unsweetened. And Louisa's favorite she says is almond milk, which you can buy pre-made from a natural food store, but you can also make on your own (there's a recipe in Lucid Food, too). And the other day I gave it a try for the first time, and it was really quite simple to make, as any almond milk recipe claims. And I was surprised how it was very light; I've not had it with anything other than this blueberry smoothie, but might try and experiment. With breakfast cereal? In baking or dessert? 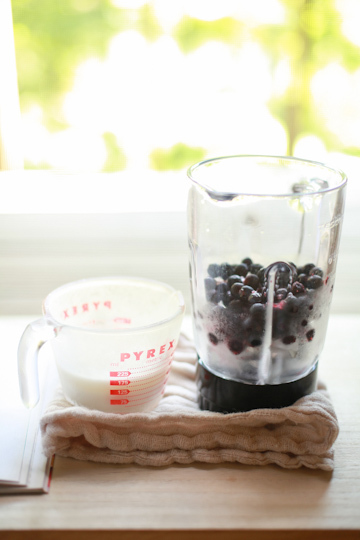 As soon as the smoothie is ready to serve, put it in the freezer and freeze until mostly solid. Break it into pieces and put them in the blender, and process it until smooth. Taste, and add a bit more maple syrup if needed. 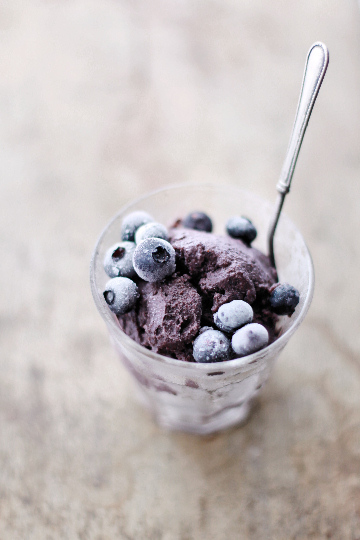 Freeze again and you have a blueberry chocolate sorbet; now this definitely is a dessert! So a big thanks to Louisa for a top recipe and a fabulous book, and for allowing me to reprint the recipe here. 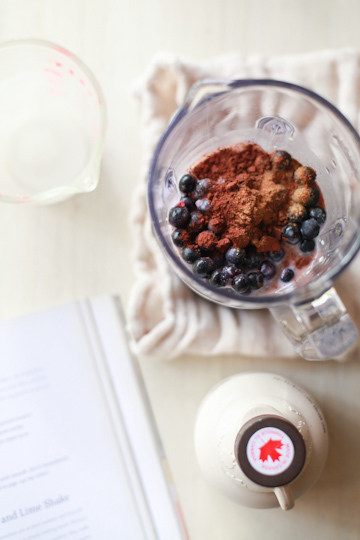 I'm excited about her upcoming book that's due next spring, but for now, I'm enjoying other recipes in her last book and above all, busy turning more blueberries into more smoothie. 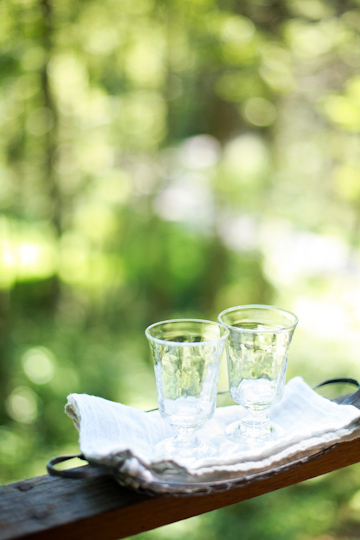 After all, summer is waning and too soon it'll be too cold for icy drinks. But I'm almost ready for it. Almost. They all look so delicious! I love the blueberry smoothie, yum! These are great ideas, and stunning photos. Thank you for the kind words about Lucid Food, it's always a thrill to hear that someone enjoys the book, and especially exciting when they're as far away as Japan! 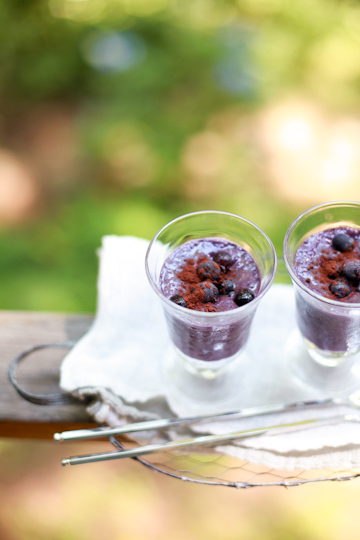 I love the idea of making ice cream with my Blueberry Choc Decadence Smoothie. I am totally going to try it! So gorgeous! I have peaches that I need to use, and now I am wonderfully inspired - thanks! looks great and so delicious. is it homemade?